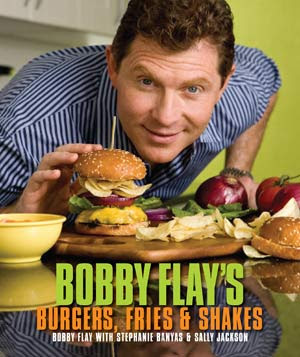 Last year I got Bobby Flay's book, Burgers, Fries & Shakes. It's been my fave book for burger recipes and each one I've tried have never failed. 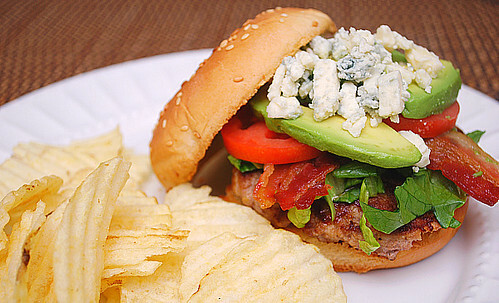 His take on burgers is that the burger itself is simply seasoned and the variations lie in the toppings. 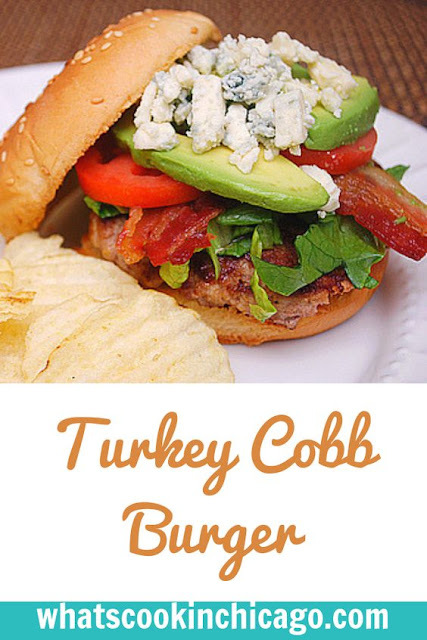 His recipe for Turkey Cobb Burgers tastes just like the salad only better with a burger! Cobb salads occupy a delicious middle ground between the decadent (hello bacon and blue cheese!) and the virtuous (lean turkey, and it is a salad after all). Whichever side you land on, there is no denying how awesome the mixture of tangy blue cheese, salty bacon, creamy avocados, ripe tomatoes, and crisp romaine lettuce is. It's not hard to imagine how good those ingredients would taste not tossed with cubes of cold roasted turkey, but atop a hot and juicy turkey burger. It makes perfect sense to me! To make the dressing, whisk together the vinegar, lemon juice, mustard, Worcestershire sauce, and garlic on a large bowl. Season with salt and pepper and then whisk in the olive oil. Cook the burgers, using the oil and topping each one with crumbled feta cheese and a basting cover during the last minute of cooking. Place the burgers on the bun bottoms. Toss the romaine with the dressing and arrange over the burgers. Top each with 2 slices of bacon, 2 slices of tomato, sliced avocado and additional blue cheese, if desired. Cover each burger with the bun tops and serve immediately.